God makes rather bold and lurid statement in Revelation 3:16 - “So then, because you are lukewarm, and neither cold nor hot,[a] I will vomit you out of My mouth.” What could be so bad to make God want to mention puke? And then you read these stories in the Old Testament. King after king made the mistake of going halfway…but not all the way. God demands complete surrender. Make your choice. King Joash is the young king who was rescued from the tyranical slaughter of the royal family by the fake-queen Athaliah. Joash was placed into power when he was 7-years-old by the HERO-godly-priest-man, Jehoiada. Joash ruled well for a time. At one point, he noticed that the temple had been desecrated by the wicked Athaliah. Things are getting Shakespearean up in here! Joash feels compelled to raise the necessary resources to restore the Temple. 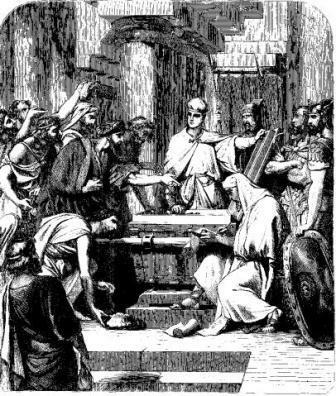 Scripture says Joash set out a chest for the people to give as they were lead. (building campaigns have been thanking him for centuries) Basically, God moved in the hearts of the people and they responded in amazing ways. See what happens when leaders step up? It’s also interesting to note that the Jewish people are linked as a people. They reject God together, but they also turn back to God together. It’s a powerful truth that the enemy often exploits. Joash was able to restore the Temple even better than it was before. Then he screwed up. The amazing priest (i love this guy) Jehoiada dies. Jehoiada was so loved by the people. He was a man that took a brave stand in a dangerous time against an evil lady. God honored him by allowing him to witness the defeat of the enemy, and to preside over a time of restoration. The line of David was returned to the throne and the Temple of God was restored to prominence. Jehoiada’s death was met with national sorrow, and he was buried among kings! Soon after, Joash lost his mind. A group came and convinced him to return the nation to pagan worship…AND THEY DID. Ugh. They killed the outspoke prophet (and Jehoiada’s son) Zechariah. God turned away from the king. Ultimately, he sas killed in how own bed by his own people. Betrayal breeds betrayal. Next comes Amaziah. For a moment there is hope. Amaziah pays attention to God, and heeds his warnings. He accepts godly advice as he heads into battle, and he is blessed because of it. God allowed the people of Judah to defeat a pagan nation. Here’s the problem. Amaziah brought back all of the pagan idols and began to worship them!! …but Amaziah wouldn’t listen. He was lukewarm. He was captured by an enemy king and killed by assassins. This portion of Romans shifts from theology to practical living. We see the beautiful verse exhorting us to live as “Living Sacrifices.” After studying the ancient Hebrew mold, this takes on such important meaning. - verse 12-21…deal with living with each other.